Why is research on diagnosis important? Improving early diagnosis of Alzheimer’s is a primary goal of much research. Drug treatments currently available, as well as many in development, work best when the disease is treated in the earliest stages, before symptoms become severe and disruptive to day-to-day functioning. 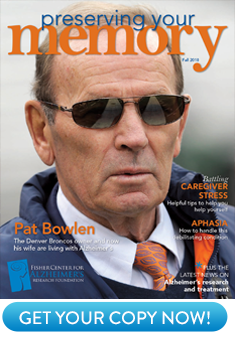 The earlier an accurate diagnosis of Alzheimer’s is made, the better. This holds true for everyone involved, from individuals with the disease and their families to clinicians and researchers. For people with Alzheimer’s and their families, a definitive diagnosis early on provides an opportunity to plan and to pursue options for treatment and care while the patient can still take an active role in decision-making. Clinicians increasingly will need effective tools for identifying people in the early stages of the disease, as new interventions are developed to stop or slow progression of symptoms. In research, earlier and more accurate diagnosis will simplify and improve recruitment for clinical trials to test new preventive drugs. Alzheimer’s disease pathology may begin to develop in the brain 10 to 20 years or more before clinical symptoms yield a diagnosis. Scientists have been actively looking for ways to diagnose Alzheimer’s in its pre-symptomatic or pre-clinical stages, and enormous progress has been made in this area. Recent advances in imaging and clinical assessment will help to identify patients in very early stages of the disease. Eventually, combinations of specific imaging strategies with genetic, clinical and neuropsychological (cognitive) assessments may become the key to identifying people at very high risk of developing Alzheimer’s. What is scientific research revealing about ways to improve early diagnosis of Alzheimer’s? Standard Clinical Assessment: Components of a standardized clinical assessment instrument appear to predict which individuals with very mild symptoms of impairment (called “mild cognitive impairment”, or MCI) or “questionable” Alzheimer’s have a high likelihood of converting to the disease over time. The assessment instrument, the Clinical Dementia Rating (CDR), is a clinical interview which stages Alzheimer’s from normal to severe based on six categories of function. In one important study, the likelihood of progressing to Alzheimer’s during a three-year follow-up period was related to the sum of the scores in the six CDR categories. This score, combined with selected clinical interview questions, identified 89% of those questionable individuals who subsequently converted to Alzheimer’s in the study. These findings provide guidelines for using a clinical assessment to identify patients most likely to convert from questionable AD to AD, improving the possibility of earlier diagnosis and earlier implementation of available interventions. Normal Age-Related Cognitive Change: Improved characterization of normal cognitive function and underlying brain changes over the life course will help in distinguishing and understanding normal from abnormal changes in memory, learning, and attention with age. Such understanding will help either confirm or, hopefully, alleviate the anxiety of many older Americans and their families, who may observe modest but perceptible changes in cognitive function in themselves or in a loved one and fear that such changes are signs of a decline into Alzheimer’s or dementia. While some experts believe that virtually all cases of so-called mild cognitive impairment (MCI) will convert to Alzheimer’s disease eventually, in some people the process may progress so slowly that the person dies of other causes before full-blown Alzheimer’s symptoms are evident. Understanding why the process is slower in some people, and finding ways to intervene so that Alzheimer’s does not develop, continues to be an area of considerable research. Detecting amyloid plaques: Scientists have been searching for a biological marker to be used in living patients to identify amyloid plaques that may be present in the brain long before clinical diagnosis of the disease. A new molecular test has recently been developed that identifies plaquesin Alzheimer’s brain tissue examined after death, and has been shown to accurately identify plaques throughout the brain in laboratory animals as well. This test is a prototype for ones that might eventually be used to identify plaques in the brains of living people, which would permit monitoring of the development and progression of Alzheimer’s as well as the clearance of plaques in response to anti-amyloid therapies. This research is, however, preliminary and ongoing. Positron Emission Tomography (PET) Imaging: The gene APOE-e 4 has been associated with increased risk of Alzheimer’s. Scientists have been increasingly interested in whether the brain and brain function of people who carry one or more copies of APOE-e 4 are different from those of individuals who do not carry the gene to ultimately see whether AD-like symptoms can be identified before the disease is diagnosed clinically. PET imaging can provide information on the metabolism of glucose (which the brain uses to fuel cellular processes) in specific brain regions, which is used to measure brain activity in those regions. Recent studies using PET show that, despite similarities in age, gender, education, family history of dementia, and baseline performance on memory and other cognitive tasks, individuals with the APOE-e 4 gene(s) have reduced glucose metabolism in several areas of the brain compared to people who do not have the gene(s). The differences in metabolism were even greater two years after initial evaluation. Lower metabolism at the start of the study predicted a greater cognitive decline in subjects at genetic risk for Alzheimer’s. Though longer follow-up studies are needed to determine how many of the APOE-e 4 carriers actually develop AD, these findings suggest that a combination of metabolic rate in the brain (as measured by PET) and genetic risk factors may be one way to help detect Alzheimer’s disease before symptoms are evident. Magnetic Resonance Imaging (MRI): Another study used a much more common technique than PET imaging, MRI, to determine whether persons in a very early phase of developing Alzheimer’s could be identified prior to a clinical diagnosis. Participants received MRI scans at the start of the study and then were followed for three years to determine who subsequently developed changes that met clinical criteria for Alzheimer’s. The researchers found that they could identify people who would develop the disease over time with high accuracy, based on significantly smaller baseline volume measurements for specific brain regions, which likely reflects loss of brain cells in these areas. A variation on this technique, called dynamic MRI, is now undergoing testing at the University of California, Los Angeles. Scientists there have compared MRI scans of the brains of people with Alzheimer’s to those who do not have the disease, creating movies that reveal progression of damage to different brain areas over time. People with early Alzheimer’s disease showed damage deep within the brain. As the disease progressed, damage spread to the sides and then overwhelmed other brain areas. These and related studies implicate specific brain areas in the underlying early pathology of Alzheimer’s and suggest that, by focusing on these areas, it may be possible to use existing imaging techniques to better identify people at greatest risk for the disease. These promising MRI techniques will need further research, refinement, and validation before MRI can become a part of standard clinical practice.